1998, and have been collecting English trios since. setting my "Hearts and Roses" Valentine tea table. three sets of china, and more. Maybe it's just better not to know. That way, I might think I need another trio when I find one. I believe most of you know what I mean. What an immaculately delicate table-setting. Anyone from two to Ohgosh could sit down to that table and find all future tables wanting. It's spare and smooth, letting the exquisite china speak for the whole room, and it just speaks to my heart. Simply perfect. I don't think I'd even need the tea. I love your collections - you really have an amazing treasure there, my dear! I have a teacup trio today as well! Great collection! They are so great for mix and match! Just another china lady, you are!!! What a beautiful array of gorgeous pink and white china! Wow! That is a pleasure to look at! You are lucky to have such a collection. Your tea table setting is very romantic. That is a beautiful rose pattern. Beautiful! You can never have too many sets! Just Beautiful ! I only have 3 trio sets but I am on the hunt for more! Your trio collection is just lovely! They really are wonderful for a cup of tea and a little nosh to go with it. I have a few sets but nearly as many as you have. They are nice to mix and match too. Thank you for sharing and coming to tea. What a fun post! You have such beautiful trio's! It's really nice to have matching dessert plates with the teacups. Keep on collecting, I know how much joy they give! Wow, what a beautiful collection! It is so nice when you have the additional luncheon plate. I love mixing and matching, too. I really don't have many "trios" and I definitely think you hold the WORLD RECORD HERE. They are all so beautiful! 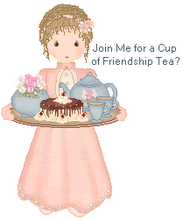 OOOOPPPS....I just came back to say I hope you will come and link to Friends Sharing Tea! I'm impressed - I have one set. They would be wonderful for a luncheon using mix and match trios. Oh my goodness what a pretty collection you have. I'm hopping over from Teacup Tuesday to leave some hugs on your lovely blog. I once was tempted to collect trios, but on second thought I didn't know where I could put them. I love seeing and enjoying yours. That is an amazing collection. I love the Royal Patrician Pattern - it's so dainty...and beautiful. I have a few Trios myself...but not nearly as many as you do. A sea of trios--I love it! And I do know what you mean about the counting. I used to do that with my pieces, but sheesh, it is so hard when you have singletons, sets, orphans ... and yes, better not to know!